Dentures have been around longer than you might think. Around 700 BC the first dentures were made out of animal and human teeth. This type of denture was even used up to around year 1800. As our diets changed and tooth decay/loss raised a better denture was developed because of the high demand in the 1800s. Even today the denture process and materials are improving where we can make them quicker and use longer lasting materials. There are two categories of dentures: conventional and immediate dentures. Our dentist in Tempe, fabricate the highest quality of denture with our local Arizona denture lab. Conventional dentures for the most part are made from high quality acrylic resins. The teeth that are made out of the acrylic resins should last between 5-7 years. Some elect to upgrade their teeth to porcelain which hold up better. The advantages and disadvantages will be discussed with you at the time of treatment. An example of a set of dentures is shown to the right. The denture on the bottom of the image that appears larger is an upper denture. An upper complete denture palate is covered. This is great because it allows the denture to have some stability from the suction that occurs. But it is also difficult due to the denture being larger and it covers the taste buds in your palate. Lower dentures (the one on top of the image) is a u-shape because your tongue rests in the middle. Lower dentures are very difficult to wear. This is due to the tongue, which constantly is moving when eating, speaking, swallowing, and even breathing. Most of our patients are electing to get at least two implants on the bottom to help with stability and others wear adhesive to keep them in. Before having your teeth removed we make molds of your teeth so we can measure and fabricate a denture before your teeth are removed. Immediate dentures are great because you have a great smile while your gums are healing. Immediate dentures are even more difficult to get used to compared to conventional dentures. During the first 3 months after the extractions your gums are quickly healing and shrinking. This makes the dentures difficult to wear. We have ways to help the denture stay in with different reline materials. But patience is needed to get used to the denture. Many forget dentures do not only replace your teeth but also the gums. So the dentures are larger than you might think due to this fact. 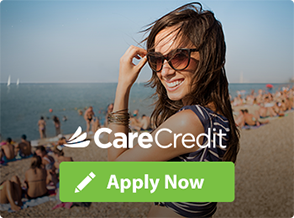 Whichever method you choose, we are here to help make the process as easy and comfortable as process. We make a lot of dentures and know how to make them to stay in and be natural where no one will know you have them. 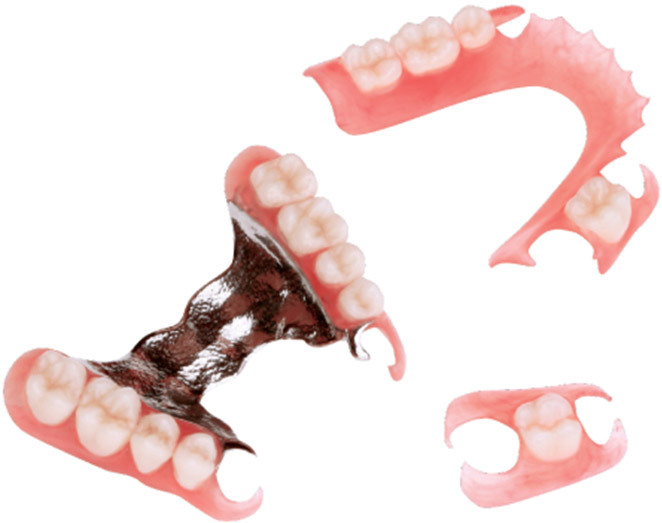 The difference between complete dentures and partial dentures is pretty simple to understand. Complete dentures you have none of your existing teeth where partial dentures you still have some teeth to help retain the partial dentures. See below for an example of a partial denture. The image shows three types of dentures. The one with the metal in it is the conventional partial denture. We have been making partials like this for a very long time. The metal in the denture gives the denture stability and helps the longevity of the partial. This type of partial allows for relining of the acrylic and replacing or adding teeth if needed in the future. The other two partials are Valplast dentures or flexible partials. This type of partial are extremely comfortable and esthetic. A couple disadvantages of the flexible partials are: the longevity is less than conventional partials and you are unable to fix or repair them. 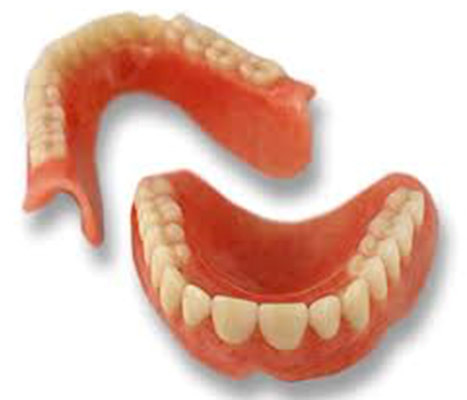 We at Tempe Family Dental offer many types of dentures and partials. Call us today at 480-838-3101 to schedule you consultation for your dentures or partials. For those that want more stability or dentures that act more like their teeth we have implant supported dentures. The most popular method of making these dentures is by placing 2-4 implants and placing Locator abutments that stick out of the gums and attaches to the denture. The image to the left shows the implants, abutments, and attachments in the denture. Locator supported denture snap on and off very quickly and with ease. The attachments need to be replaced every 6-12 months depending on your diet and habits. The locator attachments cost around $30 to be replaced. Our implants are placed and denture are made in our practice which makes the process even simpler. We have implants for all types of bone. 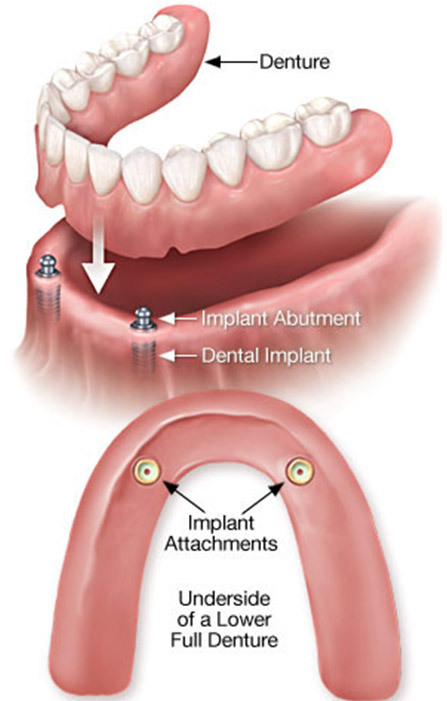 We have small or mini implants and conventional implants to help stabilize your denture.